Patchwork n Play: Fan Girl! I have long been a fan of Jen Kingwell! which I call "Heart's Content." which I call "All that Glitters"
which I call "Melbourne Town"! hereafter known as "Rockin and Rollin"! What a fun night and I learnt so much. Google her if you are curious like I was! Apparently Glitter is her all-time favourite quilt. Here is "Delilah", in all her glory! large, medium and small prints! What fun for you to attend this event! 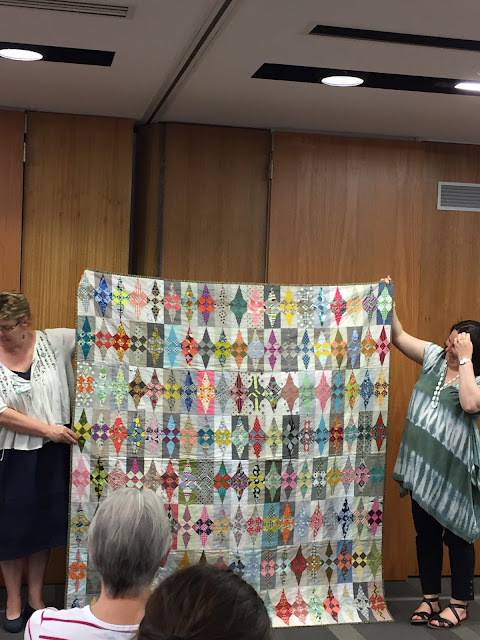 That is exactly the sort of event which will keep you inspired for several quilts to come! 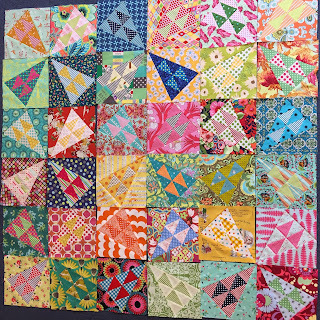 Quilter's Dream is a favorite of mine too, incidentally. Good stuff! I like all those random facts - don't know that my sewing room would be big enough for that many tubs though. Definitely keep going with your Wild Ride quilt - needs to be massive with all those glorious prints and that colour. Sounds like it was a wonderful evening! 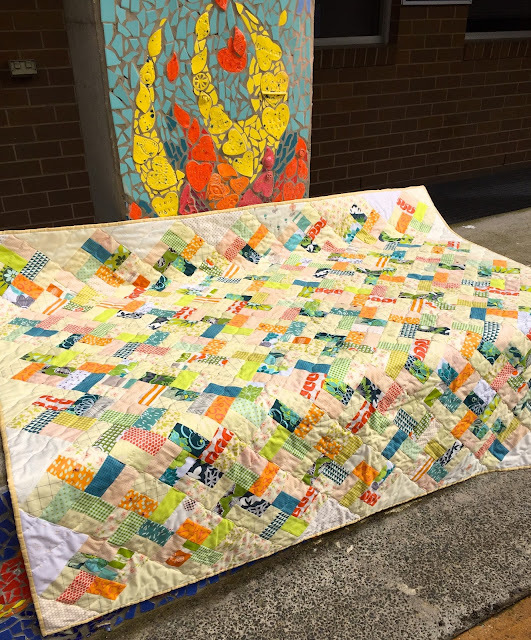 Jen's quilts are certainly inspiring. I store my fabrics by colour, but it hadn't occurred to me to break it down further into small, medium & large prints! What a fabulous night out! Would have loved to be there. 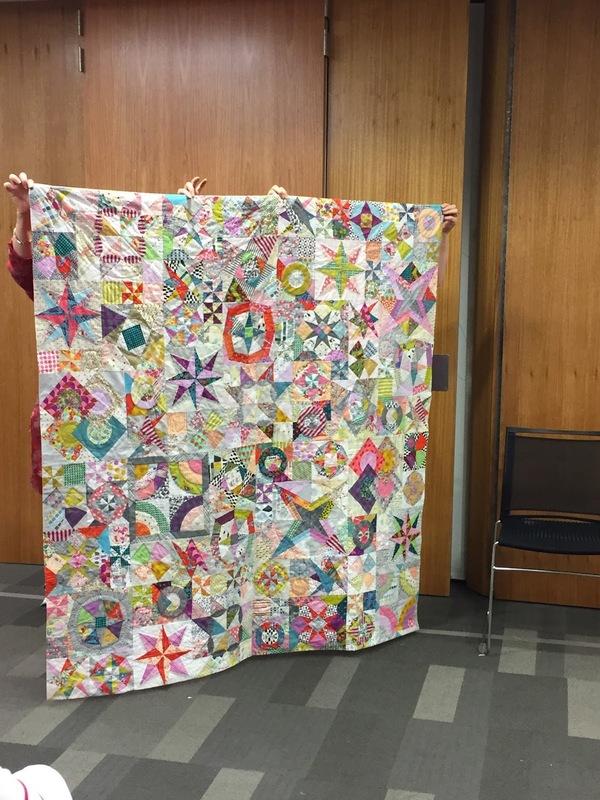 I met Jen at last year's Sydney Quilt Show when I bought one of her books - absolutely delightful. 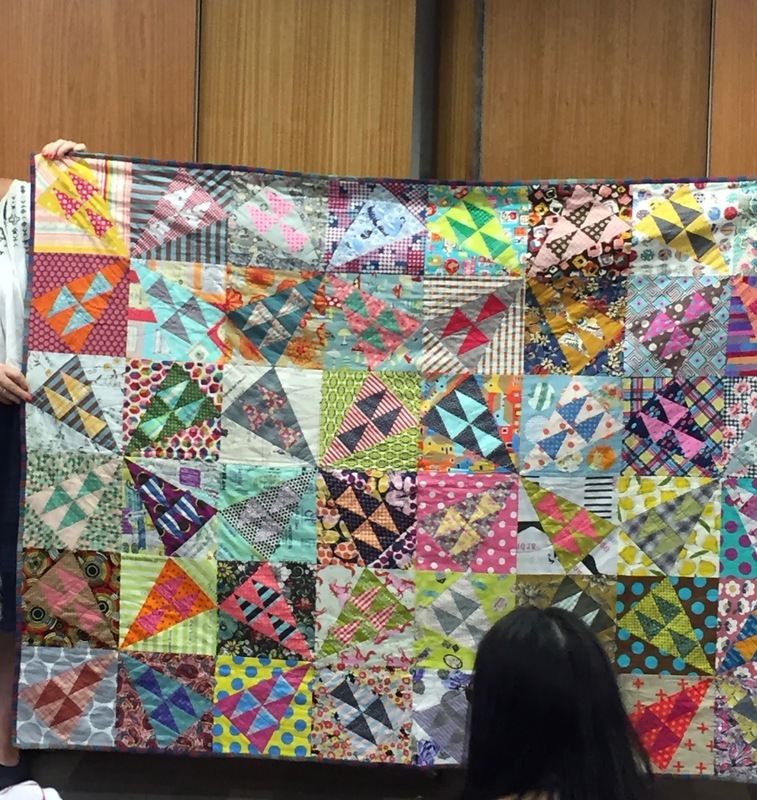 How fun to see those inspiring quilts in person! Your Wild Ride blocks are pretty awesome too! That trunk show would have been amazing... lucky lady. I also love Jen's designs... but can never decide which one to do... so haven't done any. Wow my head is spinning just from looking at all of your lovely photos, I can't imagine what would have happened if I was actually there. How nice is that goody bag and the block you made. 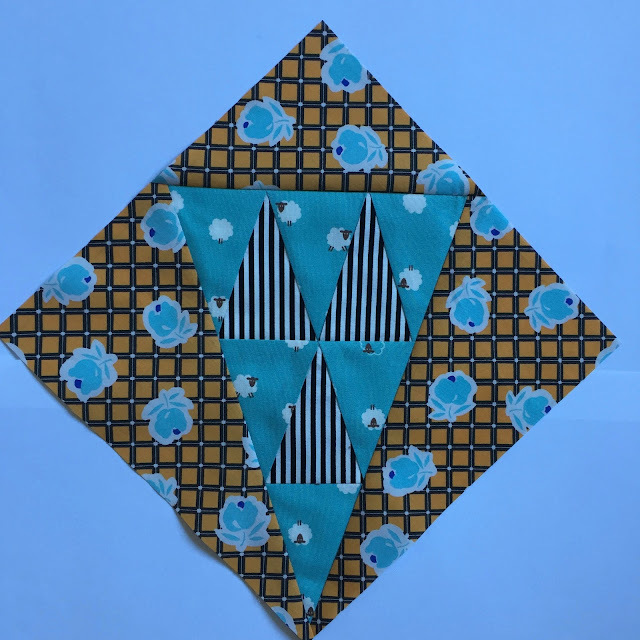 BTW, if you're wondering why it took me so long to comment, it's because I just saw your post now, no notification that you posted, and I found out about it from another quilter's blog. It sounds like a fun evening at the library! The wild ride blocks are bigger than I thought, but still totally lovely. I am so pleased the trunk show turned out to be all you expected. 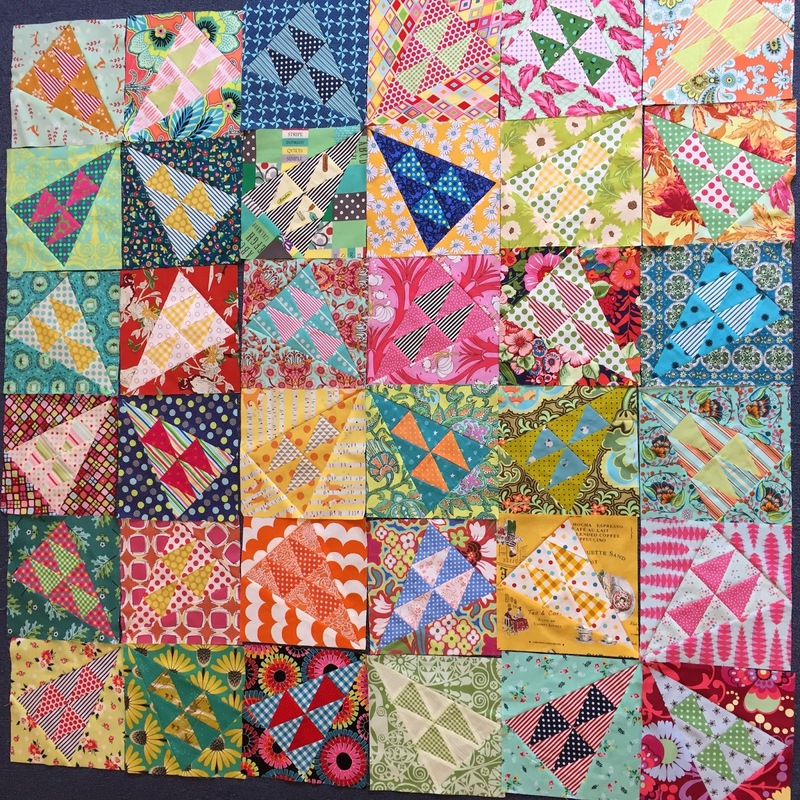 And it is lovely to revisit these gorgeous quilts you have made using her patterns. It is a feast for the eyes! I'm so happy for you to have had the chance to hear/see one of the quilters you admire. There's no feeling like it... as I discovered while at QuiltCon! There's such a "high" when one is around people who are admired, and from learning from them. 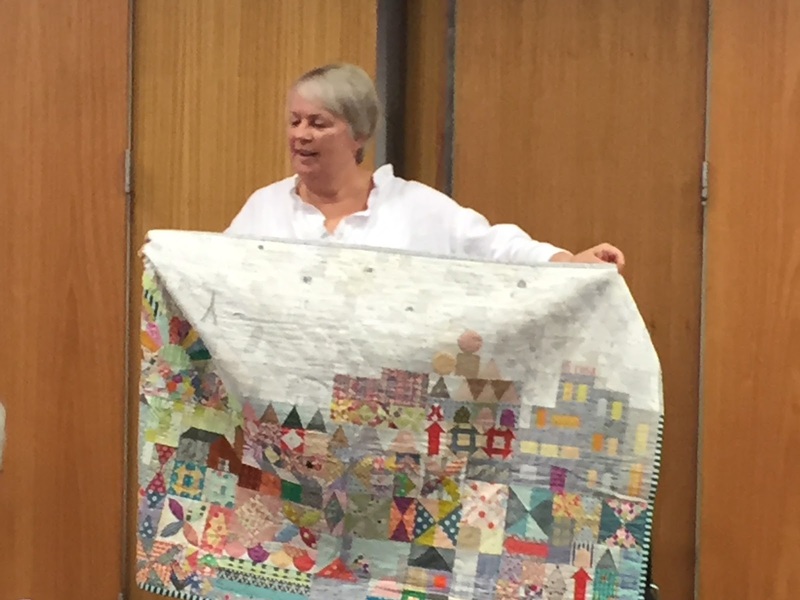 I'll have to say that getting to attend 12 lectures, as I did, was the highlight of QuiltCon for me. 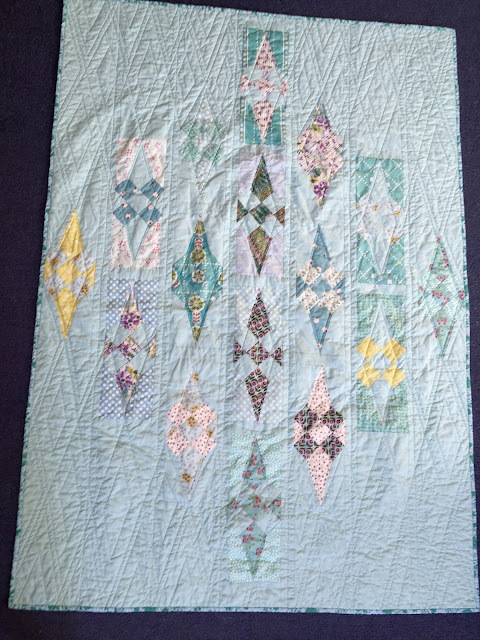 I learned so much (even me who has quilted for 30+ years! ), and received so much inspiration. 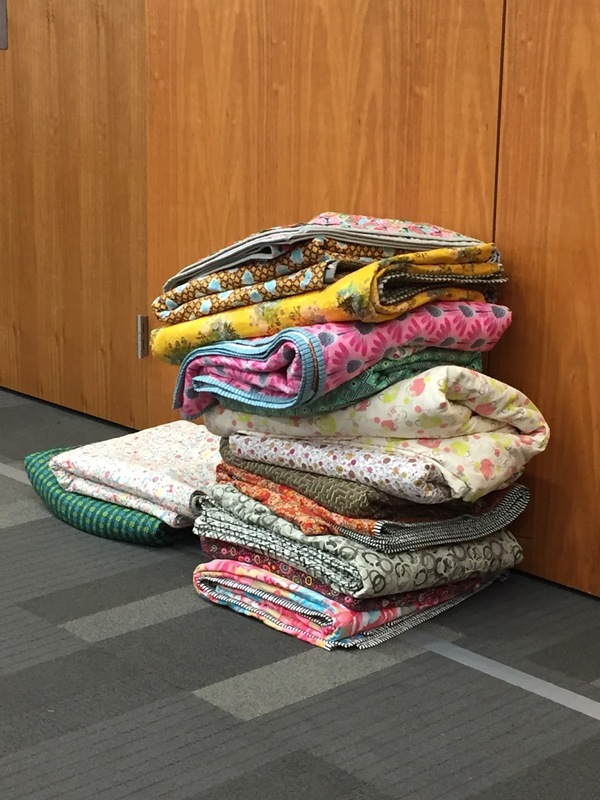 Now to contain and use all I learned, and share it in my quilts! Looks like you're ahead of the game as it relates to making Jen's designs. These are lovely to see.